Junior guard James Palmer, Jr. (24) scored a game-high 24 points for the Huskers on Monday night, including a game-winning three as time expired to lift Nebraska to a 64-63 win over Illinois at Pinnacle Bank Arena on Monday night. Photo by Kenny Larabee. It looked like it was going to be another classic Nebraska Basketball heartbreak. The Huskers, having led by as many as eight points in the second half, lost the lead with 8.1 seconds to go when junior forward Michael Finke hit what appeared to be a go-ahead three-pointer to put Illinois ahead 63-61. “We just called a timeout, and they told me and Glynn (Watson) to try and make a play,” junior guard James Palmer said. Watson brought it up and passed it to Palmer, who in traffic with time fading away, launched up a three (initially ruled a two) just before his feet crossed the line. 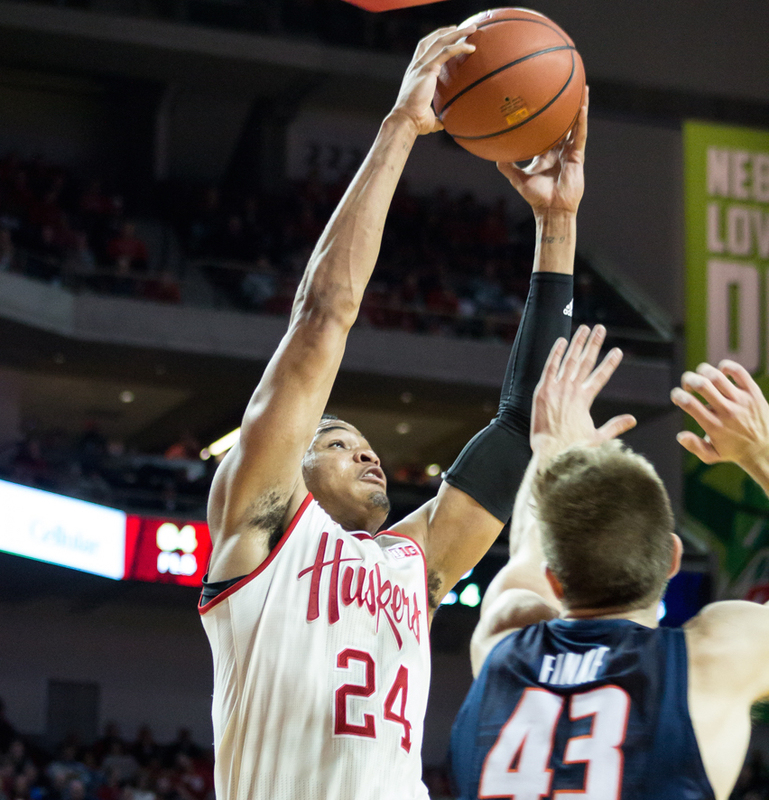 The Huskers (13-7, 4-3 Big Ten) survived 64-63. While the final shot was a beautiful moment, the other 39:58 of the game had plenty of ugly ones. Both teams combined for 38 fouls, 26 turnovers and shot a collective 8/41 (19.5 percent) from three. Roby, who got his first start of the season in place of Jordy Tshimanga, finished with nine points and ten rebounds. The Illini (10-9, 0-6 Big Ten) are still the only team in their conference to not have a win in league play. All nine of their losses have come by ten points or less this season. “Nothing is given,” Illinois head coach Brad Underwood said. “Everything is earned. Give Palmer credit. Made a heck of a shot. We felt pretty good, watching him come up the floor and we took about six seconds in the backcourt, and the kid just stepped in and made a shot over Trent (Frazier). Frazier, a 6-foot-1 freshman guard, scored a team-high 19 points. Finke, who hit Illinois’ final shot for the late lead, finished with 16. Junior forward Leron Black dumped in 13. Meanwhile, Nebraska escaped heartbreak for the second straight game and earned some much-needed momentum before a critical tilt against No. 23 Michigan at home on Thursday. “I think the guys were just really disappointed about the way they played against Penn State,” Miles said. “The could have, should have, would have part of it. So, I think they just wanted to come out and play better and get a ‘W’ and if we make our layups, just our bunnies, it’s probably an 8-10 point (lead) late in the game, but we just have to toughen up some. Nebraska was just 5/23 from three-point range and missed twelve two-point baskets, but the hero of the night still got well-deserved recognition. Palmer, after only five points on 1/9 shooting at Penn State Friday, finished with a game-high 24 points. The only other Husker in double figures was senior guard Evan Taylor. Having been replaced in the starting lineup for the first time this season by senior guard Anton Gill, Taylor made a strong case to earn his spot in the starting lineup back. “I take him out of the starting lineup, and that means something to Evan,” Miles said. “As a guy who doesn’t score a lot but does a lot of the dirty work for the team, you appreciate starting a little more than the rest of the guys. After scoring only five total points in Nebraska’s three previous games combined, Taylor finished with 13 points, five rebounds, two assists, two steals and a blocked shot. 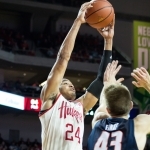 Nebraska takes on Michigan at Pinnacle Bank Arena on Thursday evening at 8 p.m. The game will be televised on the Big Ten Network. The Wolverines are the only team the Huskers have yet to beat since joining the Big Ten.